The reality of Kim Jong-un, a young man with a foreign education, coming to power in North Korea whetted the appetites of those people who have long looked for any sign of reform. Those hopes however have proven somewhat misplaced. That is not to say there is no change occurring within North Korea; there is, but it is not where people are directing their attention. During the famine of the mid 90s the Public Distribution System (PDS) broke down entirely. The top down, planned economy of North Korea was massively inefficient and its ruin caused the people who were reliant on it a great deal of harm. Agriculture was perhaps the most obvious of the state’s plans to fail. Dependent upon massive irrigation schemes and the liberal use of fertilizer, it was an industry that was highly vulnerable to disruption. The irrigation programs were in turn dependent upon electricity, which required large amounts of maintenance. When the system began to deteriorate at any point, it deteriorated everywhere and failed completely. State planning within North Korea still forms an interlocking series of nearly insurmountable issues. In order to produce enough food to survive, the North Korean government plants crops in literally every available space. The need for food is so high that there is no land available for crop rotation, so the same space is planted year after year. The lack of electricity means that people collect all the detritus they can, so they can stay warm, which in turn contributes to the lack of nutrients in the soil, which then in turn makes it harder to increase the yield. What happened in the famine was the crunch of state failure. When the state failed, the people had to compensate and they did this by resorting to underground markets. However, this was not enough and many starved. I met Chinese citizens who remember people standing on the border, filling their socks with rice to throw over the border in a futile attempt to save the starving North Koreans. It did not help, and every day more emaciated bodies would flow down the river. The population had been made dependent upon the state and as it failed, they suffered. Aid was sent but how do you distribute it when the system itself is what is broken? From this tragedy, the North Koreans citizens, led by their grandmothers, the only citizens with no official jobs, constructed underground networks of trade to China. The state has certainly not embraced the markets but they have agreed to stay out of the way. As a result, the road into North Korea from China is packed with day-trading Chinese bringing goods into the country for sale. The most important reform in North Korea has been the retraction of the state. However, you would not know that if you spoke to Chinese academics and investors. Chinese investment in the Rason Special Economic Zone is large scale: a new nuclear power plant sits just over the border, along with a new high-speed rail line and a trilingual city for doing business (the third language is Russian). A new port has been constructed, as has a new hotel and casino. Although trade is at an all time high, this has not resulted in major systematic change,. The factories are small scale and the port is empty; the Northern officials are wary of becoming too economically dependent on China. Chinese investors are tearing their hair out as their efforts are being resisted by official decisions or diluted by corruption. Chinese academics talk openly of co-opting the middle class bureaucrats so they become accustomed to dealing with the outside world. Their investment is top-down, proceeding through the established state infrastructure, with the hope of inducing structural change through wealth and interdependence. If the Chinese efforts needed any indication that their efforts were not entirely welcome, they got it when Jang Song-taek was executed. The purge might have been followed up with conciliatory statements towards China but very soon after, gold and coal exports were placed under more centralized control. The coal that is mined in North Korea is largely sold to China, even though the North Korean people need it to heat their homes. The state clearly desires foreign currency more. Thus, Chinese efforts to enter North Korea through the establishment are meeting resistance. Their “five star” hotel in Rason, where a different lifestyle is on display, stands empty and the port is quiet. The investors behind their projects are livid and their sense of disappointment is obvious. In my hotel in Rajin, investors with grey faces discussed the loss of money, both to corruption and to policy. The Chinese are not entirely wrong. To do any business in North Korea, you must engage in corruption. A budding restaurateur cannot legally open a business but bribes in the right place can allow him the opportunity to open a “state run” restaurant—as long as officials get their share, the deal continues. The resulting corruption produces massive inefficiency but is also slowly hollowing out the state’s ability to resist change. In North Korea, reform is not state policy; rather, it is the retraction of the state from people’s lives that is driving the largest engines of change. Pyongyang can still rebuff large investments because they involve the functional elements of oversight and control. The central government still maintains a significant degree of control over mineral extraction and planning. Thus, the Chinese efforts are meeting resistance because they are occurring at locations where the North Korean government is at it’s strongest. The border however, where trucks line up to enter North Korea, provides indication of real change. What the Chinese investors do not understand is in fact understood by the enterprising, day-trading citizens of the area. They do not deal with the government; instead, they are filling the space where the government has withdrawn. 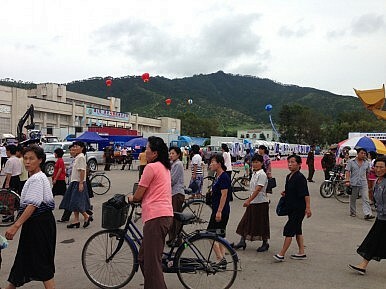 When I visited the trade show in Rason, despondent large-scale investors were lamenting the lack of progress while North Korean citizens were buying water heaters as fast as they possibly could. While the Chinese await prestigious agreements with Pyongyang, the citizens are working out a grand bargain of their own. I know which group I would bet on to produce real change.